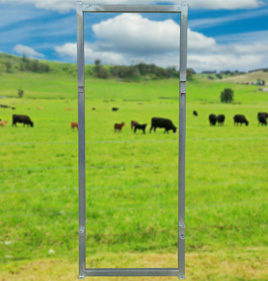 Are you looking for enclosures that are suitable for cattle and other farm animals? The team at Ace Equipment is proud to offer various cattle enclosure solutions, including cattle yard panels and cattle yard gates. These portable systems are constructed from durable galvanised steel and can be configured in a multitude of different ways for ultimate versatility. Our specialists understand that securely containing your livestock while maintaining humane conditions is an essential part of running a farm. This makes transferring your livestock between paddocks or from paddock to truck much smoother and more straightforward. 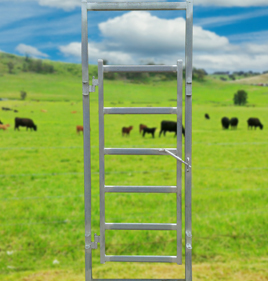 Our cattle enclosure equipment is designed to facilitate this and deliver superior results for your farm. Cattle race bows – Used to complete your constructed yard of cattle panels, our bows have a heavy duty galvanised structure for maximum strength and resilience. 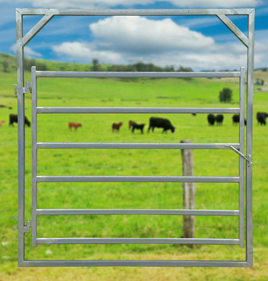 Cattle gates – Available in multiple configurations (including sliding options), our cattle yard gates feature six rails, a galvanised structure, drop bolt locks and heavy duty gal pins. 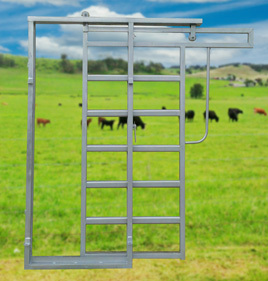 Cattle man gates – Our galvanised man gates are ideal for people who are building cattle enclosures and need a durable gate with heavy duty gal pins for their own easy access. 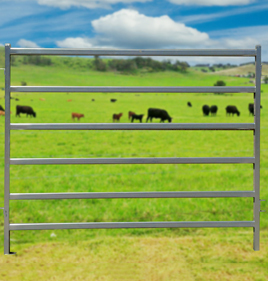 Economy cattle panels – These cost-effective panels boast six rails, are constructed from galvanised steel to withstand all weather conditions, and feature heavy duty gal pins. In addition, the team at Ace Equipment can provide corral panels and stock panels. Whatever your needs, you can rely on us to have the highest quality cattle enclosure solutions for your farm. Whether you’re looking for low-cost cattle yard panels and cattle yard gates for sale or you require a complete solution that includes panels, bows and gates all in one, you’re sure to find what you need at Ace Equipment. We pride ourselves on stocking a huge range of products to accommodate the varied requirements of our clients. The cattle yard panels and cattle yard gates we have for sale are made from the highest quality materials and have been built to last for a long time, so you can enjoy the peace of mind that comes with knowing that the product you’re purchasing will stand the test of time. 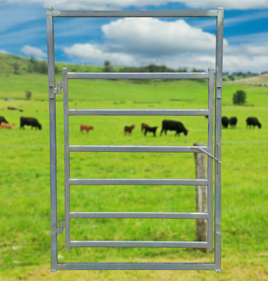 Browse our range of cattle enclosure solutions for sale today, including cattle yard panels and cattle yard gates. We offer cost-effective options that can meet your specific needs. Alternatively, you can contact Ace Equipment on 0437 014 327 to learn more or place your order.